The Calvinist Cadet Corps Mission Statement: Helping boys to grow more Christlike in all areas of life. 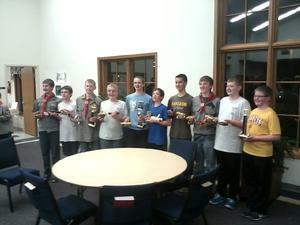 Called "Cadets" for short, this club is open to boys in fifth through eighth grades. A child does not have to attend Faith CRC in order to get involved. Faith CRC Cadets meet at 7:15 p.m. on most Wednesdays from September through April (schedule). They meet on the lower level at Faith. For for information contact one of the Cadet counselors: Clark De Vries, Scott Van Essen, or Howard Rus.